Evolution: The Story of LIfe | Z-File, Inc. 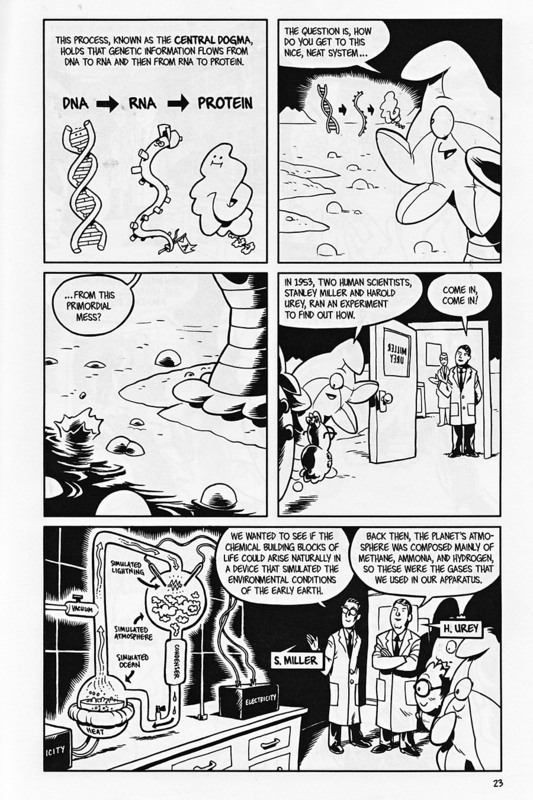 Even as The Stuff of Life: A Graphic Guide to Genetics and DNA continues to expand its fans among students, teachers and librarians, its sequel Evolution: The Story of Life on Earth is garnering fans and awards. Drawn and designed by the same award-winning team from the Big Time Attic studio, Zander Cannon and Kevin Cannon. Evolution: the Story of Life on Earth is written by Jay Hosler. A Xeric Award-winner and multiple Eisner Award-nominee, Hosler is an associate professor of Biology at Juniata College. His previous works include the much-acclaimed Clan Apis, a Xeric-awarded graphic-science volume about the biology of bees, and the Eisner Award-nominated The Sandwalk Adventures, about the life and work of Charles Darwin. The most accessible graphic work on this universally studied subject. 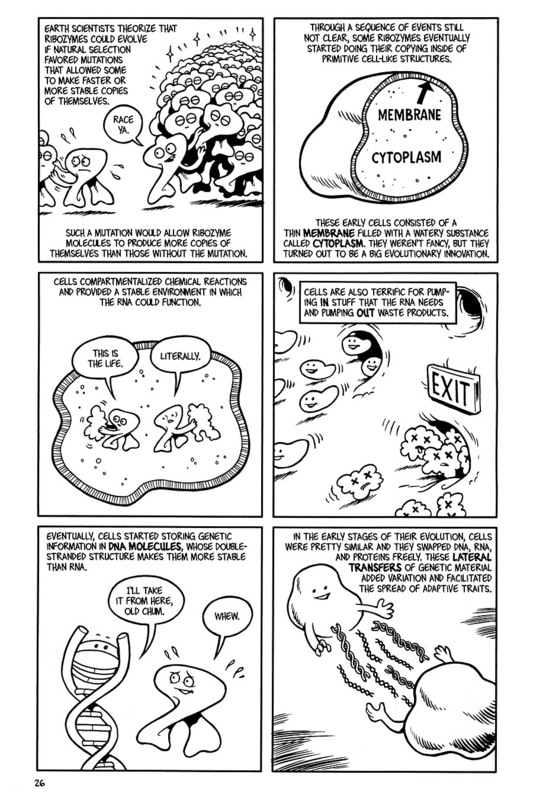 It’s hard to imagine instructional science cartooning better than this. 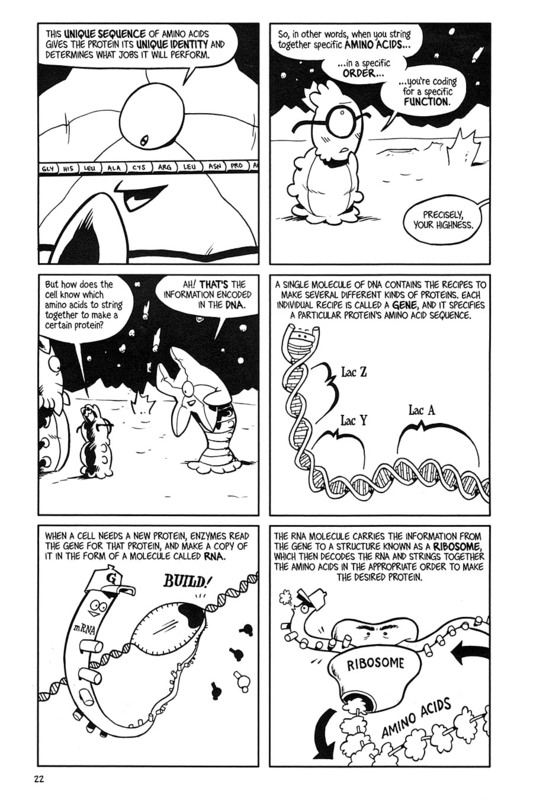 The story of evolution on Earth has rarely been presented in quite so entertaining a manner. 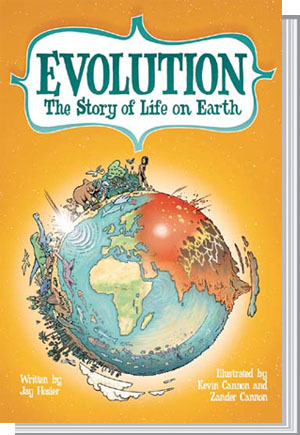 Jay Hosler has a new book out (illustrated by Kevin Cannon and Zander Cannon), Evolution: The Story of Life on Earth, and I’m afraid it’s going to be required reading for everyone, and you’re also all probably going to end up buying multiple copies for gifts. Really, it’s that good. . . . It’s entertaining and fun, and sneakily informative. If you don’t simply trust me, check out the extensive excerpts at the NCSE and at Scientific American. 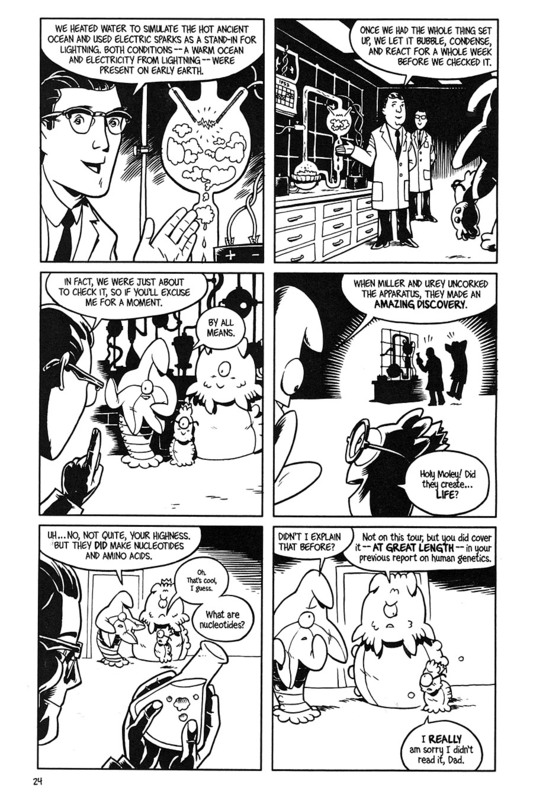 Featuring the same amusing characters as those found in Mark Schultz’s The Stuff of Life: A Graphic Guide to Genetics and DNA, Hosler’s sequel does for natural selection what its predecessor did for human genetics. . . . Hosler (Clan Apis; Sandwalk Adventures) is also a professor of biology and provides readers with much more than a simple graphic primer on evolution. With the Cannons’ wonderful illustrations providing a visual anchor, Hosler discusses everything from the atomic to the planetary, from endosymbiosis to mass extinction. . . . Readers should find . . . that they’ve learned a tremendous amount about earth’s evolution, and have had more than their fair share of amusement in doing so. Back to the watery world of the sea-cucumber-like species Squinch for another course in the elements of life on Earth. . . . Complete with glossary, this delightful book seems ideal for nonscientists who want to entertainingly brush up their knowledge of evolution as well as for students from middle school on up. It is not often that the books I am asked to review go missing. After hours of searching, I found the errant item, with the spine cracked, in my teenage son’s room—an otherwise book-free zone. I can offer no higher recommendation . . . 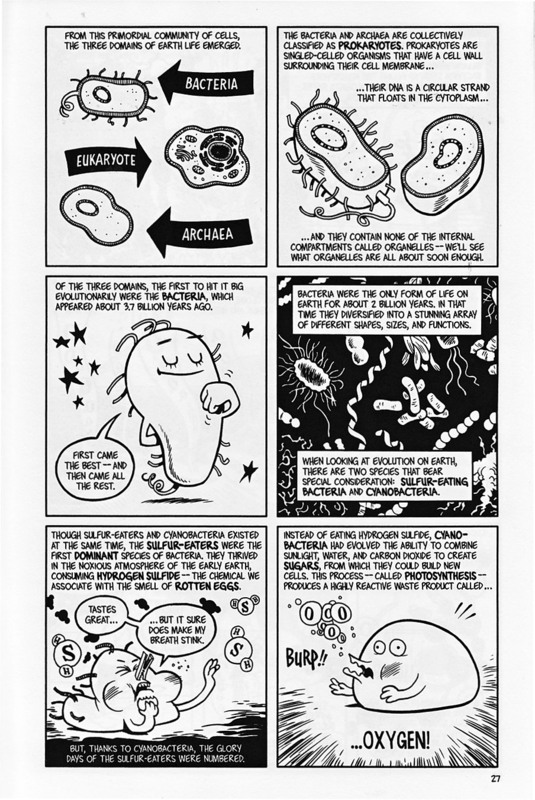 I am not sure why comic books make words like alpha-proteobacteria less daunting, but they do. Every classroom should have this book.
. . . This book is funny, fun, and authoritative, and includes talking mitochondria and a charming song-and-dance routine by a male bowerbird seeking to be sexually selected. If you like comics, you’ll like this book. If you’re interested in evolution, you’ll like it even better. It’s got a lot of information presented with a lot of fun. Ideal for high school and college students and teachers, and anyone who wants to enjoy the story of evolution. Jay Hosler is an associate professor of biology at Juniata College, where he teaches a number of courses, including Evolution, Neurobioloty, and Comics and Culture. 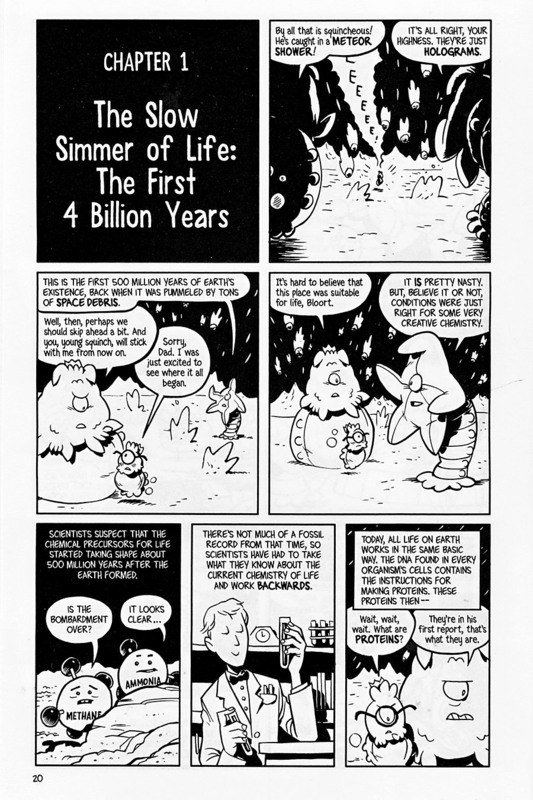 He has been writing and drawing science comics for more than a decade, and his graphic novels include a biography of a honeybee (Clan Apis, 1998) and an action-paced conversation about evolution between Charles Darwin and a follicle living in his left eyebrow (The Sandwalk Adventures, 2003). 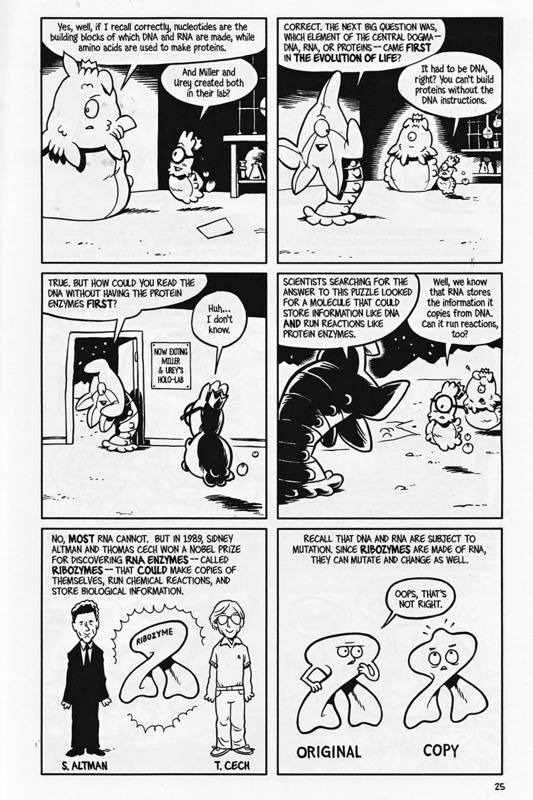 An advocate of comics as a great way to convey the wonder of science, he received funding from the National Science Foundation to develop a comic book textbook on eye evolution called Optical Allusions (2008). 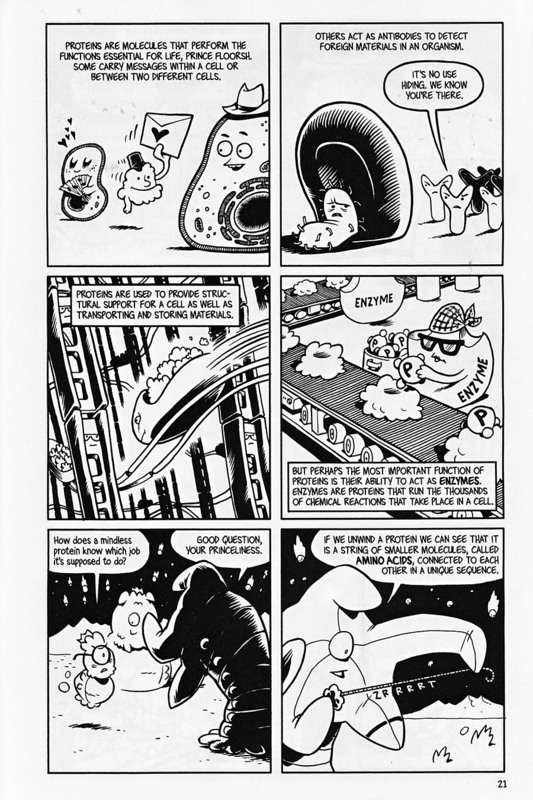 His comics have won a Xeric Award (1998) and have been nominated for multiple Eisner and Ignatz Awards. Currently, he is the assistant director of Juniata’s Center for the Scholarship of Teaching and Learning (SOTL), and his research focuses on the role of comics in improving science education. He lives in central Pennsylvania with his wife and their two little nerdlings.